Are you looking for an android phone with great camera, better performance, and latest features? 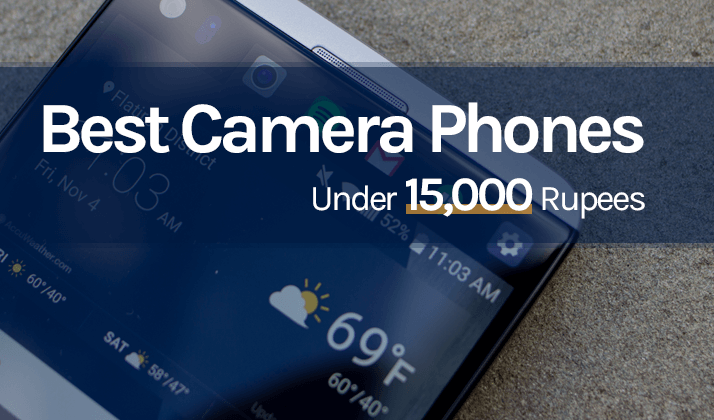 In this article, I have handpicked some of the coolest, fastest and seriously the best camera phones under 15000 rupees. In the Indian market, this price range is considered as a mid-level range as it fits best into the budget of a middle-class Indian family. And the best part is that most of the mobiles released in Indian market come under this range. Today within 15,000 rupees budget you get your hands on almost all the latest features of modern smartphones like the fingerprint scanner, latest Android operating system, 4G VOLTE support, high performing octa-core processors. But for this article, I have really focused on front camera quality as they are really necessary for great selfies and essential requirement of youths. I won’t waste your time and will suggest you go through my detailed review on every smartphone. First of all, let me make it clear that I have done extensive research while creating this review on smartphones. It took me more or less 10 hours for collecting, compiling the content. Then it took me additional 5 hours writing reviews on individual phones listed here. And I would also like to mention that this is my first post on my blog. I believe it is going to be really satisfied with your’s that is my reader’s help and love. I know that you know this smartphone doesn’t come under 15,000. But if you could just extend your budget with 2000 Indian rupees, then you can get hands on this phone. Priced at rupees 17,000 it offers a marvelous camera which is powered by Sony IMX230 sensor along with other important features. It has 21MP primary and 8MP front backing camera. The primary is attached with dual LED CCT flash which makes it really easy to take bright pictures even in low light environment. It supports 4K and slow motion recording. Now let us talk a bit about its display. It has an IPS capacitive touchscreen which has a resolution of 1980 x 1080px and support for 16million colors. The pixel density of the screen is close 401 per inch. This device runs on one of the most powerful Hexa core processor Snapdragon 808. This processor is based 64bit architecture. It has Adreno 418 GPU and 3GB ram which makes that you can play most graphics demanding games without any glitches. Furthermore, this device comes with 3500mAh battery. This phone had to be on my list. It comes from the world know multinational brand Asus. Most of the peoples know Asus because of their high-end graphics cards and gaming cabinets, but they also have a vast portfolio of smartphones. I must say this device is truly a camera beast. I mean it’s one among the very few mobile under 15000 rupees which comes with 13 megapixels primary as well as a 13MP secondary camera with dual LED flash support. In order to capture high-quality pictures, it has auto-laser focus lens. These lenses utilize the power of the laser to know the distance of the object placed in front of it. It uses unique pixel enhancing technology which helps to increase brightness by 400% in dark environment. So basically you just need to install few selfie apps, and you are ready to take high quality, HRD pictures. Asus zenfone selfie comes with a unique panorama mode which allows you to take the selfie in 140 degrees. This unique feature ensures that you capture every smiling face near you. As far as performance is concerned, Asus zenfone selfie is available in 2 variants. In the first low-end option, you will get 3GB ram along with 16GB internal storage. Qualcomm Snapdragon 615 processor ensures that your phone can play some of the most advanced games without any lag. It has a battery of 3000mAh. I think it’s powerful enough to help you carry out your daily activities for at least 16 to 20 hours. This Android smartphone was launched back in September 2016. It comes with 5.5 inches full HD display, and the pixel density is around 401 ppi. It is boosted with 4GB ram and has Snapdragon 617 which is an octa-core processor. Coolpad Note 5 features a custom Android operating system named as Cool UI. Cool UI just masks the default design and styles of the Android operating system. Other than that, it doesn’t offer any additional core functionality. This budget camera phone offers 13mp primary as well as an 8mp front camera. It is equipped with LED flash which makes it easy for anyone to take good quality pictures even in low light. Furthermore, coolpad Note 5 is powered by monstrous 4010 mAh battery. This amount of power is enough for 200hrs of standby, 14 to 20 hours of talk time. Lenovo needs no introduction. It is one of the biggest Chinese technology company. It doesn’t only make some of the coolest smartphones but also make quality Laptops, tablets, etc. Lenovo z2 plus comes with a 13mp primary and a super clear 8mp front facing camera. The secondary camera comes with 1.4um pixels which give you the freedom to take wide angle selfies. It utilizes electronic image stabilization (EIS), and auxiliary sensor in order to reduce shutter and frame lag. It has a unique feature named U-Health which acts as a personal health care assistant. This app is powered by professional and powerful Pro-fitness Sensors. These sensors keep tracks of your steps and your calorie. These sensors can easily know when you are walking or running. Lenovo z2 plus is currently available in 2 different models. The first model is powered by 3GB ram and 32GB rom The second model which is more powerful is equipped with 4GB ram and comes with 64GB internal storage. It’s a flagship phone from Moto which is a subsidiary of Lenovo. Moto M has been redefined version of Moto g series. This new series is equipped with more ram, better processing power, and an outstanding camera performance. Moto M is powered by MTK Helio P15 64-bit processor. This ensures that your phone is able to run every HD videos, modern apps, and games without any problem. To give you the extra performance boost you get 3GB ram. It is not a phone because you cannot call a 16.4cm (6.44 inch) screen a phone display. I should also point out that it has 2.5D curved screen and the total thickness of this premium phone is 7.5mm. It’s better to call it a phablet which is a combination of a mobile and tablet. Mi Max as the name suggests has maximum power with the greater premium look. The starting price of this Android smartphone is Rs 14,999 which makes me keep it on this post. The opening variant comes integrated with Snapdragon 650, six core processor which is powerful enough to carry out multitasking without sweating. It also has hefty 3gb ram along with 32gbrom which you can expand by using external sd cards. In order to give you unmatched picture quality, Mi Max comes with 16MP primary and 5MP secondary camera. It has dual tone LED flash and has face detection, phase detection autofocus, geotagging features. The more powerful variant is available for Rs 19,999, and it has Snapdragon 652 processor, 4GB of ram and 128GB internal storage. And how can I miss the most important part of this phablet? It has a record breaking 4850mAh battery, and still, the thickness is just 7.5mm, which is impressive. You can check the table for more details. It’s one of the lightest phones I have ever seen. It weighs just 95 grams yet comes with some extensive features. A 16-megapixel primary and the 8MP front facing camera is something which every selfie nerd needs. It has super touch sensitive 5.5 inches full high definition screen. The fingerprint scanner is very responsive. On an average, the response time of fingerprint scanner is 0.15 seconds. The battery power of this device is 3000mAh, and it supports Dynamic Voltage Scaling technology to optimize the charging efficiency. This phone is available for Rs 11,000 in the Indian market. It has 5.5 inches full HD screen which is protected by Gorilla Glass 3. The pixel density of the screen is around 401 pixel per inches. Furthermore, it has a 13mp primary and 8mp secondary camera with led flash. Note 5 has Android 6 operating system, and to improve the performance, it has Qualcomm Snapdragon 617 which is an octa-core processor. This phone also has massive 4GB ram and 32 GB internal storage and is expandable up to 128GB. It has a mighty 4010 mAh battery which can easily handle 200 hours of standby. It has support for 4g LTE on both sim slots which means you can use two jio sims at the same time. Furthermore, its powerful battery will allow you to use 4g network for a longer period. Same as the other Android based camera phones listed here it has a 5.5-inch screen with 1920 x 1080 pixels resolution. Honor 5X has Qualcomm Snapdragon 615 MSM8939v2 Processor which has extremely high performance and is combined with 2GB ram which enabled smooth user experience. It has 16GB internal memory, and it can be expanded to 128GB. It has the 3000mAH Li-polymer battery. For enhanced protection, it has a fingerprint scanner and to offer easy to understand UI it has simple UI with larger fonts and icons. To provide you with impressive picture quality this phone comes with Sony IMX 214 13MP primary camera. It has an 8MP front facing camera. It has a modified version of the Android operating system called as Cyanogen 12.1. To offer you with increased talk time and increased the working hours it has 4100mAh non-removable lithium-polymer battery. It has got latest USB 3.0 Type-C interface. It has 3GB LPDDR3 RAM and 64gb internal storage. I would like to tell you that USB 3.0 type-c is almost ten times faster than the USB 2.0. This basically means a higher rate of data transfer between your device and this mobile. Though I agree that this model is pretty old, just because of its reliable performance and durability I have added it to my list. Furthermore, it has all the features which you will find in premium flagship mobile phones and that at a lower cost. This is one among the flagship smartphone by Lenovo. First of all the price of this mobile is very reasonable and I will its actually cheaper when you compare its features with other companies flagship products. Lenovo phab 2 plus is available on Amazon for 14,999 rupees, but the question is what do you get for this price. Well, you get a massive 6.4-inch full HD display. Yes, you read it right. It has a 16.4 centimeter, 2.5D curved screen. It has Gorilla Glass 3 coating to protect your screen from tampers and scratches. Now let us talk about the picture quality. To help you transform yourself into a professional photographer, this device has 13MP primary camera which supports laser focus along with PDAF light supplement. The quality of the pictures is enhanced by the Milbeaut image processor. This image processor is usually found in premium quality DSLR, and you are getting it on a smartphone which is priced at India Rupees 14,000. The front facing camera is of 8MP and-and has a 75-degree wide-angle view. Phab 2 Plus is the world’s first mobile which has Dolby Audio Capture 5.1 system. It com JBL earphones which help to provide enhanced sound quality. This smartphone comes with 13MP primary and 8MP secondary camera. It has support for HDR images and comes with LED flash. It has a screen size of 5MP and comes with full HD resolution. I must admit that the screen size is small when compared to other mobiles in this segment. This device runs on Android 6 operating system and has Adreno 405 GPU. It also has 3GB of ram and 32Gb of internal storage. The battery power is also quite low as compared to other mobiles in this segment. Vivo v3 has a battery of 2550mAH which I personally feel is inadequate for multitasking users. You must have heard of Lenovo Moto G models. Well, the first model launched back in 2012 and 2016 Moto G plus was released. It’s the most powerful and features rich variation released, and it is available in 2 different models. The first low-end level is available with 2GB ram, 16GB internal storage. It has 16MP primary and 5MP secondary camera. The second high-end variation comes with 32GB internal and has 3GB ram. Both of the models have a fingerprint scanner, and both of them runs on Android Nougat operating system. Which is the best smartphone under 15000? Well after writing reviews on all these smartphones and since I have personally used most of them, I will go for Asus Zenfone Selfie. If you can afford an increment of 2,000 to 2,5000 rupees, then you must go with Lenovo Vibe X3. It’s an all rounder phone and gives you access to all the latest features. Furthermore, it has a massive 21MP primary camera. If you liked this article, then please share it with your friends, and if you have any queries, then please mention it below. when it comes to buying smartphones this range that is mobiles under 15000 is the best and most affordable price range to buy mobiles. thank you so much for showing this amazing best smartphone under 15k.